I remember reading a lot of my father’s Sax Rohmer books when I was a child, so this was both a trip down memory lane and some light reading over the last week or so, nothing to do with uni study. One of the things that I’ve always liked about Rohmer was his ability to write action and suspense and this one in particular has lots of the evil Dr, which makes for good reading. 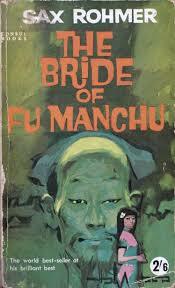 The premise of Fu Manchu developing a new insect-borne plague to unleash on the world is really quite good and inspired many other writers (including Ian Fleming) and is still a viable plot device in the 21st century. Of course, the few women are pigeonholed into the usual stereotypes – bumbling domestic bit-player (Madam Dubonnet) femme fatale (Fah lo Suee) and the helpless heroine who constantly needs saving (Fleurette) and the men really don’t fare that much better! Alan Sterling, the narrator for this outing is about as bland as a hero can be, but how he reacts to some of his trials is quite good. But this is a book of its time and irrespective of the incredibly dated gender politics it’s still a good pulp read. Do you enjoy reading? What are your favourite genres/books/authors? Leave a comment – I love to hear from you!